When it comes to conceptual musical characters, few are as out there as Jacqui L. Even David Bowie’s iconic Ziggy Stardust looks normal compared to this creation which is at best, but still bafflingly, self-described as “a scorpion/alien from the planet PP5,” whose eyes are for whatever reason on her tail. 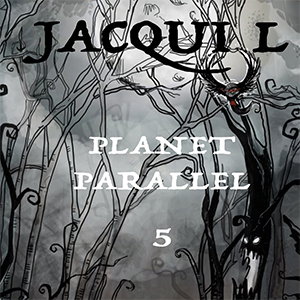 Dense exposition set aside, the facts remain, although scarce, that the project originates in Sydney, Australia, and Jacqui’s debut album, Planet Parallel 5 was created, at least in part, by a small group of musicians, the real human Jacqui L among them. Instead of diving any further into the extensive backstory, it’s perhaps best to examine the music independently of the character selling it. At its heart, Planet Parallel 5 is prog rock for fans of Tim Burton and gothic aesthetics with some metal dynamics thrown in to enhance the theatrical element of the album. Each song is like an outsider’s perspective on the human experience, most notably the grimmer aspects, and although some like “Happy Birthday” are more playful, many more like “Stroke It” are subtly harrowing in their depictions of aspects of society accepted by large as normal. Perhaps, it’s an album that would work best without the somewhat confusing concept, but the songs are strong enough to nevertheless stand up on their own.